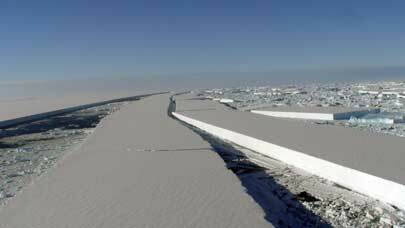 Part of the Wilkins Ice Shelf in Antarctica has broken off and another part is hanging on by a narrow strip of ice. The ice has been in place for at least a few hundred years. In other places where this has happened it has been deadly for penguins because they can no longer reach the water or they can no longer climb back onto the ice. WASHINGTON – A chunk of Antarctic ice about the size of Manhattan suddenly collapsed, putting an even greater portion of glacial ice at risk, scientists said today. 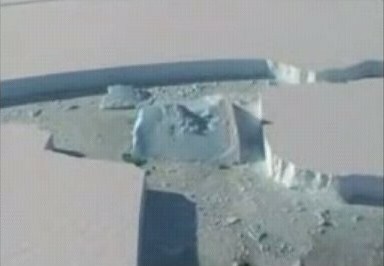 Satellite images show the runaway disintegration of a 414-square-kilometre chunk in western Antarctica, which started Feb. 28. 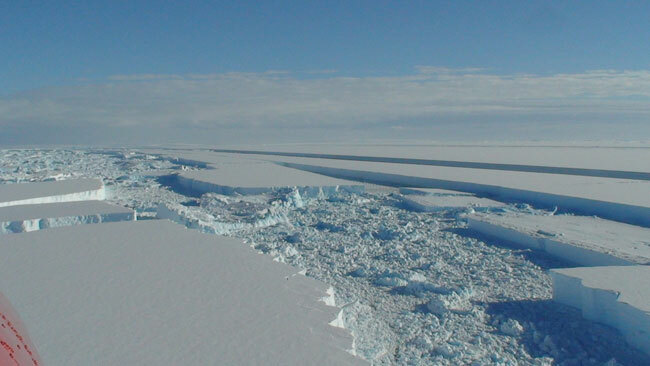 It was the edge of the Wilkins ice shelf and has been there for hundreds, maybe 1,500 years. This is the result of global warming, said British Antarctic Survey scientist David Vaughan. Because scientists noticed satellite images within hours, they diverted satellite cameras and even flew an airplane over the ongoing collapse for rare pictures and video…. The rest of the Wilkins ice shelf, which is about twice the size of Prince Edward Island, is holding on by a narrow beam of thin ice. Scientists worry that it too may collapse. Larger, more dramatic ice collapses occurred in 2002 and 1995. Vaughan had predicted the Wilkins shelf would collapse about 15 years from now. The part that recently gave way makes up about four per cent of the overall shelf, but it is an important part that can trigger further collapse. There is still a chance the rest of the ice shelf will survive until next year because this is the end of the Antarctic summer and colder weather is setting in, Vaughan said. 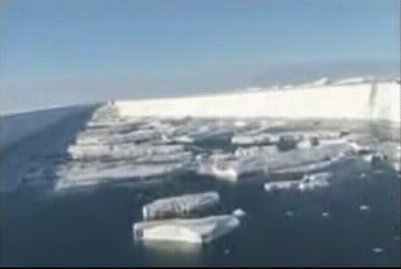 Scientists said they are not concerned about a rise in sea level from the latest event, but say it is a sign of worsening global warming. 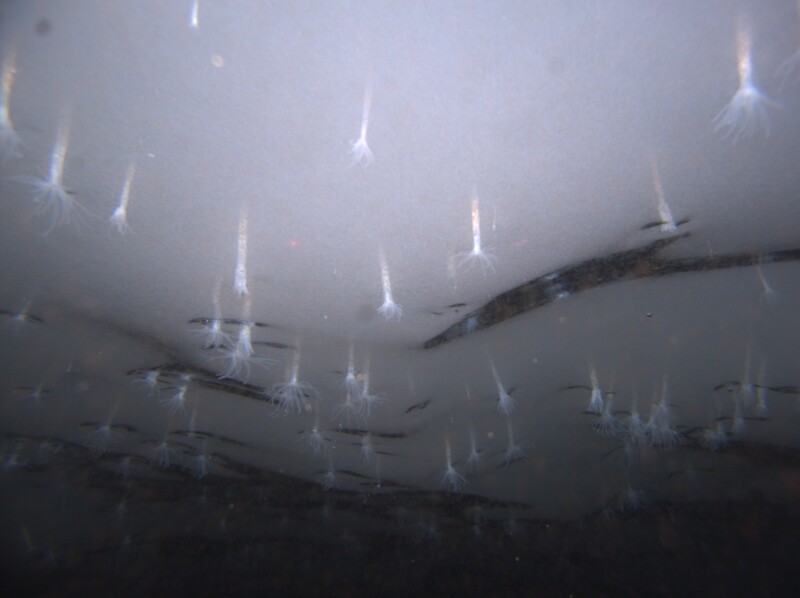 Such occurrences are “more indicative of a tipping point or trigger in the climate system,” said Sarah Das, a scientist at the Woods Hole Oceanographic Institute. Climate in Antarctica is complicated and more isolated from the rest of the world. Much of the continent is not warming and some parts are even cooling, Vaughan said. However, the western peninsula, which includes the Wilkins ice shelf, juts out into the ocean and is warming. This is the part of the continent where scientists are most concern about ice-melt triggering sea level rise. See also: Wilkins Ice Shelf on verge of collapse (MSNBC) . 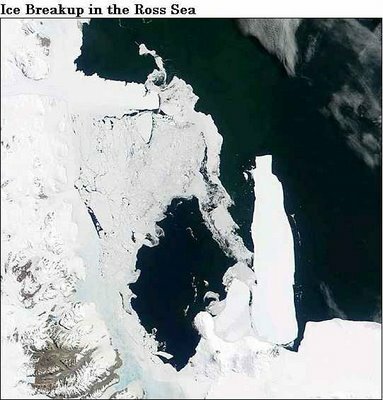 For previous events, see “Ross Ice Shelf break-up in Antarctic,” (Dec. 20, 2006), “Dude, where’s my ice shelf?” (Dec. 30, 2006), and “Arctic Ice reaches new low in historic times” (Aug. 2007). 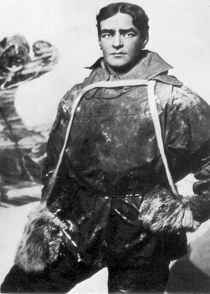 Follow the link to read Ernest Shackleton’s own account of his expeditions to Antarctica. Speaking of religion and society, tonight I went to hear Ayaan Hirsi Ali at one of our local Indigo bookstores. When the Dutch filmmaker Theo van Gogh was murdered for producing the film “Submission,” about the Muslim religion from the point of view of women, her name was pinned to his chest with a knife. It was her screenplay. She is now living in the U.S. and there were police at the talk (and book-signing) to guard her. Tonight we watchedthe movie March of the Penguins and also the documentary about its making. The director of photography for the movie, Laurent Chalet, and his assistant, Jerome Maison, spent one year in Antarctica shooting the film. 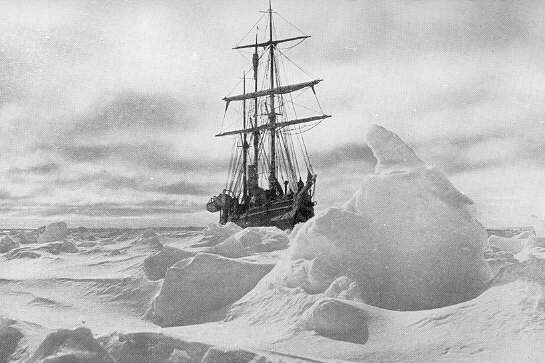 At one point they were lost in a blizzard and had to be rescued by the French Antarctic research camp. The Antarctic is beautiful, the penguins elegant, smooth, funny, and enduring. The penguins are monogamous for their breeding, brooding, and chick-rearing period of about nine months. One educational site that I read stated that the penguins try to find their mate of the former year and only choose another if that mate does not show up. 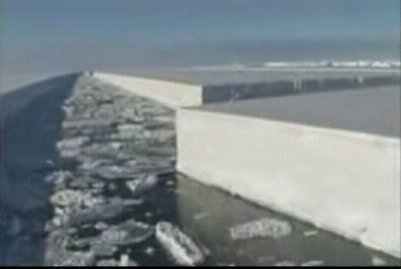 The main link is an image of the Ross Ice shelf in Antarctica. NASA news brings us an animated time-lapse imaging of the breakup of the Ross Ice Shelf. Science News has more discussion including what might happen to the penguin colonies.